Hello Nosh Show Listeners! I am back in all my crazy Dubba glory, did ya miss me? Thanks to Nick for filling in for me while I was down at the shore, but it's time to get back to business. Now I wasn't really sure what I was going to post along with this episode, but as I listened to it on the way in to work, it hit me. I need to talk about my disdain for the new Rainbow Sherbet Fruity Pebbles. 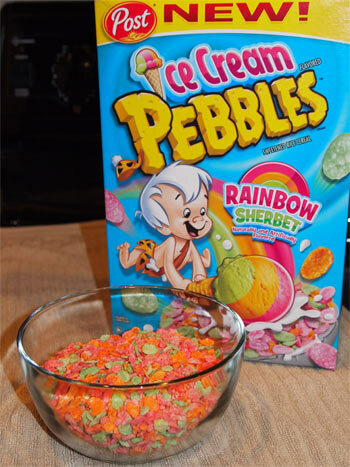 Yes, these new Pebbles taste like Sherbet, but in the worst possible way. I love good sherbet, but this is not good sherbet. You know that generic sherbet wonk that every cheap sherbet has? Yeah, that's what this tastes like. It's strong, it's fake, and I couldn't even get through a bowl of it. I will try them in a breakfast sundae in the near future, I just havent had a chance to yet. On Episode 60 we also talk about our new shared love Oreo thins. That's right, Oreo thins are excellent and three out of four Nosh Show hosts agree that Golden is the best of the bunch (who is the 1 out of 4? You'll have to listen to find out). We also quickly cover the potent new Key Lime Pie Oreos and then delve in to the 2015 entries in the Lay's Do Us A Flavor contest. As always, I hope you enjoy the show. Have a good week everyone! Sherbet is not ice cream. "Sherbet is not ice cream." And we can credit the Marketing team for that intentional snafu.